Whether grilled, broiled, fried, baked, or picked up at the local fast-food restaurant, hamburgers are one of the most popular foods in America. Our beloved hamburger has been around for more than 100 years. According to The Encyclopedia of American Food & Drink, by John Mariani, one of the first known mentions of a "hamburg steak" in print was in 1884 in the "Boston Evening Journal." The term "hamburger" appeared on a New York Delmonico's restaurant menu which was believed to have been printed in 1834. In Mrs. Rorer's New Cook Book (1902), the hamburg steak is described as beef put twice through a meat grinder and mixed with onion and pepper. By 1912, ground meat patties were being served in buns, and according to "The American Dictionary of American Slang", the suffix "burger" came to mean "any hot sandwich served on a bun, often toasted, with many condiments...."
White Castle opened their first "hamburger stand" in 1921 in Wichita, Kansas, and the popularity of the hamburger grew as Americans began to travel by car. In the 1950s the McDonald's chain began, creating more competitors. Also according to "The Encyclopedia of American Food and Drink", Americans eat three hamburgers per week per person! That's about 38 billion annually, or 59 percent of all sandwiches consumed. Pictured: Grilled burgers (slider size) in homemade slider buns. These easy grilled burgers are flavored with some Worcestershire sauce and a bit of brown sugar. Top them with a slice of pepper jack or cheddar cheese and your choice of toppings. Remoulade sauce and chipotle mayonnaise are delicious on burgers, and they're a nice change of pace from ketchup or mustard. Taco or burrito seasoning flavors the burger mixture, but the toppings make this a true burrito-flavored burger. Refried beans, salsa, pepper jack cheese, and your favorite burrito toppings make this burger extraordinary. These indoor burgers are seared and then baked in a hot oven. A little steak sauce, Worcestershire sauce, and cayenne pepper jazzes these burgers up. An egg and breadcrumbs bring the ground beef and diced bacon together in these great-tasting burgers. The burgers are flavored with simple seasonings, along with chopped onion and Worcestershire sauce. These yummy turkey burgers are made with a combination of turkey thighs and turkey breast, making them lean but still juicy. Included in the recipe for these easy garlic burgers are four tasty sauces: Secret sauce, Sriracha mayo, and chipotle mayo. Ground chicken thighs keep these burgers moist and juicy. The chicken burgers are flavored with garlic, some lime juice and cilantro, and Cajun seasoning. Poblano chile peppers have a pleasant flavor and heat when roasted, and they make a great topping for burgers. These burgers are grilled, but they can be pan grilled or broiled. For more heat, use pepper jack cheese on the burgers. Ground pork sausage and ground beef team up in these delicious stovetop barbecue burgers. These are similar to sloppy Joes, but with barbecue flavor. Sautéed sliced mushrooms are tucked into the center of these delicious burgers. Top your burgers off with your favorite cheese and toppings. Tex-Mex seasonings add flavor to these burgers along with pepper jack cheese. Broil, grill, or pan-grill these burgers. These round beef patties are topped with classic Reuben sandwich toppings, including Swiss cheese, sauerkraut, pickles, and Thousand Island dressing. Serve the burgers open-faced on rye bread or serve them in multi-grain or rye buns. Use fresh sockeye salmon to make these delicious burgers. Cilantro, ginger, and sesame oil give them Asian flavor. Serve the salmon burgers with a spicy chili mayonnaise or sweet chili mayonnaise (see directions, below). Cook the burgers on the grill, an electric grill, or in a grill pan on the stovetop. These little meatloaf burgers are baked in muffin tins. 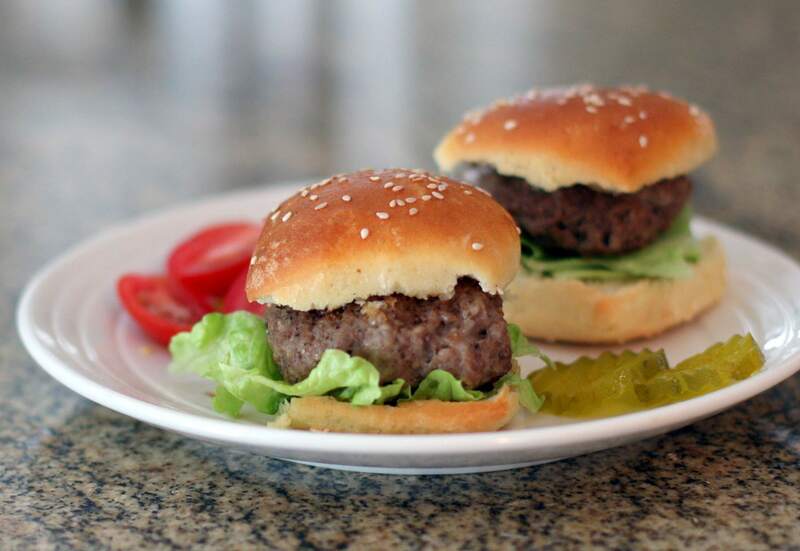 The burgers are the perfect size for sliders. Top them with bacon and cheese if you'd like. Hosting a BBQ? How Many Burgers per Person Do You Need?